Seb: I shot my first ever naked torso yesterday. 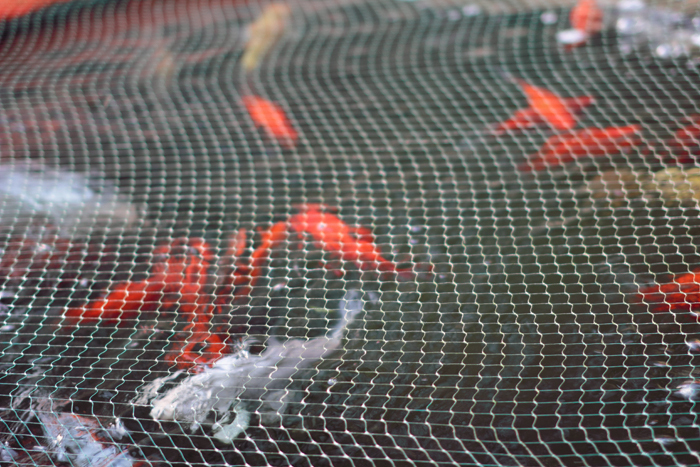 For some reason, right next to where we were doing the shoot, there was a huge tank of koi (Japanese carp). Some small and some ooh-you’d-be-worth-a-lot large (seriously, large koi can cost thousands — check it out). Anyway, very hard to focus through water — that guy at the front IS in focus, but the netting makes it quite an interesting/tough photo to digest. Abi: I spent the entire day in bed today, my sleep patterns are dodgy at best so sometimes you just need a duvet day to stop you dying of exhaustion. I guess I could have been out enjoying the weather. Today it was gloriously sunny and the light streamed in through the window for the first time in ages. I could have moved, should have got up. But I didn’t, I’m lazy like that. Click either photo to visit our Flickr streams, for wild comments, notes and more.